There's been some more work on examples...this time an example that combines the use of the ECF discovery API with the use of the ECF remote services API. This makes it possible to automatically discover and remotely access arbitrary OSGi services. Note the type of the service is 'remotesvcs', a new type. For those interested, the publicly registered types for RFC 2782 are listed here. Note that in this case the discovery is being done by the ECF zeroconf/bonjour/rendevous provider. The UI and the code that uses the discovery, is, however, discovery protocol independent, so that it can (and will) also be used with SLP discovery...with no changes to the middleware or application code. (f) = future -- calling thread does not block, and an instance of IAsynchResult is returned immediately Receiver can inspect IAsynchResult for completion. These access methods are made available via the ECF IRemoteService. Note that the proxy can also be accessed directly in the OSGi service registry via BundleContext.getServiceReference() or a ServiceTracker. In this way, if complete API transparency is desired, then it can be done this way. 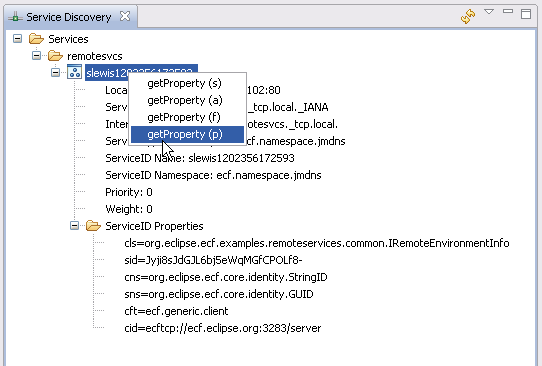 Note that the client gets/receives all the information necessary to connect to and access the remote service via the service discovery (i.e. via the ECF discovery API)...the user doesn't have to provide any extra information in order to find and use the remote service. Further, the middleware and UI code is completely transport independent...allowing the use of ECF generic, r-OSGi, JMS, javagroups, XMPP, or other/proprietary providers without the need to modify the middleware and/or UI. org.eclipse.ecf.examples.remoteservices.common. This bundle has the service interface class org.eclipse.ecf.examples.remoteservices.common.IRemoteEnvironmentInfo. Note that this interface is very much like the Equinox EnvironmentInfo service, and essentially all the service host implementation does is turn around and call the local EnvironmentInfo service. 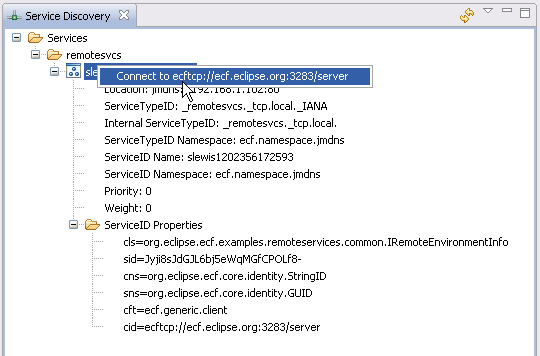 org.eclipse.ecf.examples.remoteservices.server. An extremely simple Equinox-based server that registers the remote service, publishes the service discovery info, and implements the remote requests. Source is here. 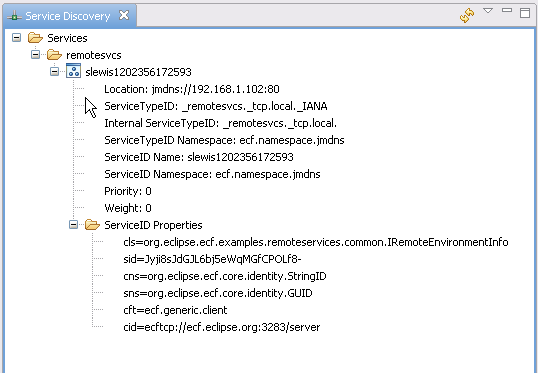 org.eclipse.ecf.examples.remoteservice.client. 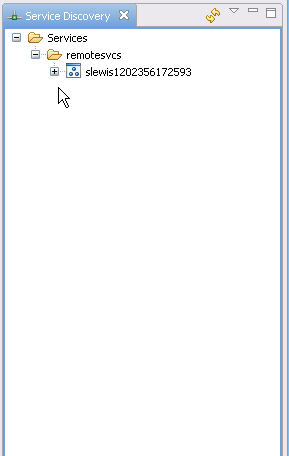 A very simple client that implements the discovery view extension point. Here is the class implementing the serviceAccessHandler. This also has the ugly UI code for getting the getProperty parameter and showing the result. Note that the client and server processes do not need each other's bundles...they only need the org.eclipse.ecf.examples.remoteservices.common bundle.